RBI provides the opportunity to the candidates to work as a Grade B officer in the apex financial regulatory authority. But RBI Grade B exam is not everyone's cup of tea, and descriptive English is something where most of the people do stuck. Unexpected topics, the writing strategy and flow are examined. Your understanding and awareness of the topic are also judged. 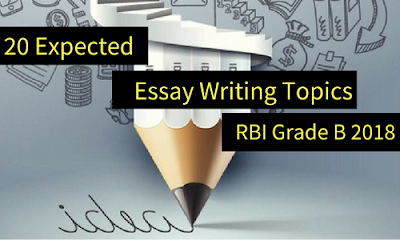 Therefore, it becomes very important to get an idea of the expected topics for essay writing so that you can practice them before the exam. Here are the few expected essay-writing topics. Adhaar-Pan Link- Why is it so important? Steps Taken by Govt to Tackle NPA? Jan-Dhan Yojana and Minimum Balance Penalty- How will it work? Why did Government decide to bear Merchant Discount Rate? Discuss GST as a tool to curb black money. How can India improve its ranking in Human Development Index? What improved India's rank in Ease of Doing business?